Meeta Vengapally is the Founder and CEO of Garnysh, a Silicon Valley-based fitness and technology company that uses real-time data and analytics to track fitness activity and fulfill nutritional needs with a growing database of custom meal plans created by local food purveyors. If you are involved in any kind of serious exercise activity, then you know the pain of calculating your daily nutritional requirements and all the shopping and cooking that goes along with making sure you have the correct amount of calories, fat, protein and carbs (aka macros) in your diet. Well, after having two kids while attending grad school (yes, you heard me right! ), this powerhouse decided that she was going to dedicate herself to getting back in shape with CrossFit, and she discovered personally just how much time it took to eat properly in order to support her fitness goals. Working with her tech team, Vengapally has created an app, currently in beta, that not only tracks the user’s fitness activity, but then calculates the precise amount of food required to meet the macro requirements of that level of exercise. Taking it one step further, she has established relationships with local healthy food purveyors to create custom meals and make them directly available for pickup or delivery. 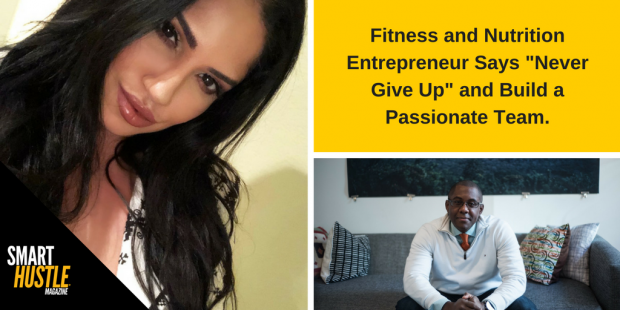 Was there ever a moment in your entrepreneurial journey when you felt like giving up? And where have you found the strength to keep going when things got difficult? During the initial launch, there were a lot of disappointments, and people didn’t believe Garnysh would work. There were times when I was in tears, especially during the early months, when the majority of the people I went to said “no.” I received maybe 10% yesses. FortunateIy, I have never been one to take no for an answer, because it turns out that not giving up is the number one rule for successful entrepreneurs. Even when I did feel like giving up, I was driven by my need to be there for my advisors, and later, for my team. I’m extremely lucky to have such a strong support system. Between my family, my mentors and my core team, I have built-in motivation to keep going, to live up to the expectations of the people who have put their trust in me. Their presence in my life has helped me to feed into my own fire and my drive, and find strength in all the no’s to keep going. I can’t stress enough how important it is to have a strong support network in place. You can’t win at this game all alone. How did you move from development to product testing? We developed a focus group of testers that was a good mix of people who are tech savvy and people who are working in the fitness industry. We needed to hear from people on the user end -- especially crossfit enthusiasts who would hold us to a really high standard based on their specific needs and experience. We needed to know if our tech would solve something for them and actually make their lives easier. I had to become comfortable with being able to pivot and evolve my vision in response to feedback and changing circumstances. My advice to anyone who is at this phase of their product development is to have a focus group where participants have full freedom to give you ALL feedback, both positive and negative. Mostly, you want the critical feedback, as that will take you to the next level. If it’s all positive, it won’t help you to do any better or grow. For me, the key has been in not getting too attached to any one solution, but rather staying focused on solving the problem. What was most important to you in building a strong team? In Silicon Valley, there’s no shortage of tech people, but I needed people who were just as passionate as me, prepared to take risks and try new concepts. I also needed people with complementary skills to mine, as well as the openness to let the project evolve, and the willingness to learn and grow with me. And finally, they needed to be confident enough to speak their own minds. The people I trust are also people who know how to trust their gut and follow their intuition. Too often, women have had to choose between their family and their careers, but you seem to have integrated your personal and business interests very well. Can you speak to that? My dedication to my family has definitely served as inspiration for my company, as well as a model for keeping my business circle small and tight. I rely on the advice and guidance of my mentors -- their faith in me serves as daily fuel to continue to grow and excel. And we all know about the rule of taking care of yourself before you can take care of others, hence my concentration on my own fitness and health. So yes, I do think that my personal interests are at the foundation of creating a healthy family as well as developing a successful business. Certainly being able to use time more efficiently as I accomplish my fitness goals is a win/win for everyone involved, at the same time as it has formed the core of my business model. Garnysh is currently operating locally in the Silicon Valley area and plans are quietly underway to evaluate the New York City market. In a city with so many busy, stressed out people concerned with fitness and health, and no shortage of gyms and culinary talent as potential partners, it seems a particularly fertile ground for development.